final walk through hinges on our performance. We won't let you down! Construction clean up can be challenging to most janitorial companies. Not CEBM. Experience is the best teacher. We have 50 plus years of experience in janitorial and construction clean up. We are the best choice! Many companies offer construction clean up and then rent the equipment. 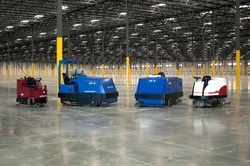 We own all of our equipment including the 4 large ride on auto scrubbers/sweepers shown above. Those machines separate the men from the boys when it comes to large facilities. Office buildings and medical suites require more fine tuning to complete construction clean up. Our cleaning crews are experienced with vinyl floor waxing, exterior and interior window cleaning, carpet cleaning and facilities maintenance. We detail everything. We are the clean up guys. Please call us when you need the best cleaning at the best price! We also have Industrial Shredders available for purchase.